The flowchart above delineates the components of the WSVBS and their interplay. The bottleneck of runway systems prevails in ground proximity because there stalling or rebounding wake vortices may not descend below the flight corridor. Therefore in that domain the best wake prediction skill is required which here is achieved based on measurements of meteorological conditions with a SODAR/RASS system and an ultra sonic anemometer (USA). Because it is not possible to cover the whole glide slope with such instrumentation, the meteorological conditions in the remaining area are predicted with a numerical weather prediction system (NOWVIV) leading to wake predictions with increased uncertainty bounds. Based on glide path adherence statistics (FLIP) the probabilistic wake vortex model P2P predicts upper and lower bounds for position and strength of vortices generated by heavy aircraft. These bounds are expanded by the safety area around a vortex that must be avoided by follower aircraft for safe and undisturbed flight (SHAPe). The instant when these safety areas do not overlap with the flight corridor define temporal aircraft separations that are translated into established procedures by the arrival manager (AMAN). 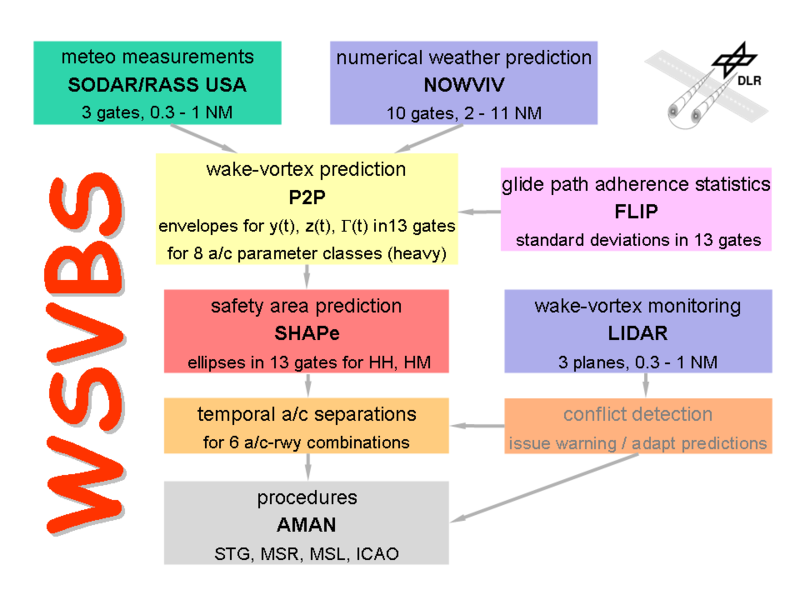 As a safety net the LIDAR monitors the correctness of WSVBS predictions in the most critical gates at low altitude. The WSVBS has demonstrated its functionality at Frankfurt airport. In the period from 18/12/ 06 until 28/02/07 the system ran stable - no forecast breakdowns occurred; aircraft separations could have been reduced in 75 % of the time compared to ICAO standards; the predictions were correct: at least for about 1100 landings observed during 16 days no warnings occurred from the LIDAR. Fast-time simulations revealed that the concepts of operation, introduced by the German air safety provider DFS, yield significant reductions in delay and/or an increase in capacity by 3% taking into account the real traffic mix and operational constraints in the period of one month. Relaxing the DFS constraints and allowing more operation modes (e.g. reduced in-trail separations) would further increase capacity or reduce delays. As next steps DLR will expand the WSVBS to include also landings on runways 07/L/R and departing traffic in both directions. The LIDAR shall be operated automatically and the traced vortex positions shall be used on-line to check for forecast errors and warn the operators in case of an increased risk. A risk analysis of the WSVBS will be pursued. Finally a combination of our system with DFS's warning system and installation at Frankfurt Airport is envisaged together with DFS, first to be run in a shadow mode and eventually to become fully operative. Detailed descriptions of the WSVBS and its performance are available here.